Since the earthquake tsunami and nuclear meltdown at Fukushima Daiichi, he has emerged as a powerful voice and a central figure in charting Japan’s future energy course in the wake of disaster: in scores of well attended public lectures, in daily media consultations and interviews, in his widely read posts and in three books that have helped to redefine public consciousness and official debate. Koide Hiroaki. Photo from Ohmagrock blog. In 1968, as a freshman in the department of nuclear engineering at Tohoku University in Sendai, he believed in the potential of what he had been taught to be an inexhaustible source of energy that could solve the energy dilemmas of a resource-poor nation. But learning that a new nuclear power plant was to be built in sparsely populated Onagawa, some 50 km from the city centre where the electricity would be consumed, he reflected on the imposition of risk burden on vulnerable communities. Indeed, his Kyoto University nuclear research facility is not in the city, but on the southern edge of Osaka Prefecture, near rural Wakayama Prefecture, because of the potential danger. This socio-geographical recognition of the dangers of nuclear power and the price that would be paid by marginal communities as a result of decisions imposed by the Japanese government and the power monopolies is at the heart of his abiding critique of nuclear power. Before March 11, Koide’s was a voice in the wilderness in a nation committed to nuclear power. Subsequently, the thousands who appear at his public appearances would convey a sense of a new pop star. Koide comes out to greet the hundreds who overflowed the Meiji University lecture hall in Tokyo for the April 29 event “The End of the Nuclear Power Age.” Photo by Marumori Aya. For the first time, Koide has become a fixture in the mainstream media, including newspapers and major TV stations. His new book, “Genpatsu no uso (The Lie of Nuclear Power),” is a bestseller.1 The “Unofficial Koide Hiroaki Matome,” a blog that collects daily links and video footage of Koide’s talks and appearances, is one of the most important—and popular— Fukushima-related websites. 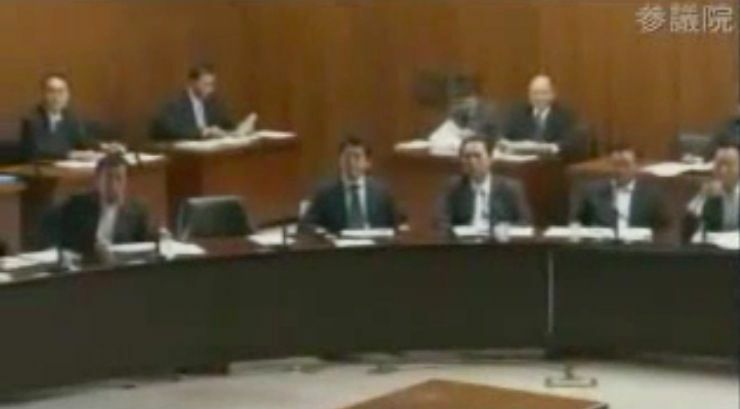 On May 23, 2011, the Government Oversight Committee of the House of Councillors (the Upper House) invited four guests to address members of the Diet – Koide, Ishibashi Katsuhiko, a seismologist who has long warned of the reactors’ vulnerability to quakes, Goto Masashi, a former Toshiba nuclear engineer who now defies the industry, and Son Masayoshi, President of telecommunication giant Softbank and, since 3.11, an outspoken proponent of renewable energy. The unprecedented government effort to seek advice from staunch critics of nuclear power policy is indicative of fresh winds blowing at a time when the government is calling for a sharp increase in renewable energy and curbing of nuclear power and the nuclear power giants and their supporters in the bureaucracy are fighting back. Thousands across the nation and overseas watched Koide’s criticism of the government being webcast, sharing through Twitter the excitement of seeing their best kept secret being unveiled in a grey business suit, at the centre of Japanese politics - the very centre he has exposed throughout his career. At the same time, a human chain was being formed around the building of the Ministry of Education, Sports, Science and Technology (MEXT) where Fukushima parents and their supporters rallied to protest against the ministry’s decision to raise the allowable radiation exposure level.2 Viewers of the two simultaneous events had one eye on the relentless Koide, and the other on teary and angry Fukushima parents. I came here today to offer my candid advice to the Japanese government and its administrators who have managed the country’s nuclear power policy to today. I entered the field of nuclear engineering with high hopes and dreams, because I believed that nuclear power was the energy source for the future. Oil and coal would be exhausted some day, but nuclear power was inexhaustible, so I thought nuclear power was the way forward. However, once I entered the field, I realized that nuclear power was actually a very poor energy source. Let me explain why. Shown in the figure above are the remaining non-renewable energy resources on this earth. The largest deposits are of coal. It is known to exist on our planet in enormous quantities. The white square indicates the total reserves. What is known to be commercially exploitable is called proven reserves, the blue part of the square. Now look at the tiny square on the top right corner of the slide. This is the world’s total annual energy consumption. The proven reserves of coal alone can provide 60 to 70 years worth of global energy demand. If we could use the total reserve of coal, it would provide 800 years’ worth of world demand. Next to that, we have reserves of natural gas, oil, and other sources that we are not really using right now, like oil shale and tar sands. I had thought that these fossil fuels would someday be exhausted and nuclear energy was the future, but in fact, the world’s reserve of uranium is only a fraction of that of oil, and a small percentage of that of coal. Uranium is actually a very scarce resource. But when I say this, people in the pro-nuclear camp say that I’m wrong. They argue that what I am talking about is only the amount of fissile uranium resource, which is limited, but by converting non-fissile uranium to plutonium, we can make nuclear energy that is recyclable. Let me explain. To produce nuclear energy, we must start by mining uranium. After enrichment and processing, we burn nuclear fuel in reactors. But this itself does not make nuclear energy a source of energy. So nuclear energy proponents say we can go beyond this process and actually make nuclear energy a recyclable source of energy. By using specific reactors called fast breeder reactors (FBR), we can breed plutonium and by reprocessing it, we can complete the nuclear fuel cycle, and make plutonium a source of energy. In the end, the cycle leaves us very troublesome high-level radioactive wastes, so we must find a way to dispose of these sometime in the future. This was their scenario. Plutonium is not a naturally-occurring substance, so they planned to use plutonium that is generated as a by-product of existing nuclear power plants, then use it in the nuclear fuel cycle in which the key technology is FBR. However, this FBR, which is the heart of this grand scheme of a nuclear fuel cycle, is actually impossible. Now I will show you how the Japanese FBR plan was envisioned and then faltered. In the graph shown, the horizontal axis indicates the years between 1960 and 2010, when the Long-Term Plan for Development and Utilization of Atomic Energy (the “Long-Term Plan” for short) was in place. The vertical axis covers from 1980 to 2060, indicating the target years that the Long-Term Plan projected the FBRs to be practical. The first mention of the FBR was in the 3rd Long-Term Plan in 1968, in which they stated that the FBR would be practical by the first half of the 1980s. But they soon found this goal difficult to achieve, and in the next Long-Term Plan they revised to say that by around 1990 the FBR would succeed. Failing again, the Plan was revised five years later, they rewrote that the FBR would become practical by around the year 2000. But this again failed. In the next revision, they wrote that it would become practical by 2010. This too failed. Next, they stopped using the word “practical,” and changed the objective to “establishing systematized techniques” in the 2020s. But this again turned out to be impossible. Next, they put the goal off to 2030 for establishing systematized techniques. What happened in the next revision? When they revised the Long-Term Plan in the year 2000, they could not even show the projected year at all. And again, five years later, they revised the Long-Term Plan, this time giving an exaggerated name like the “Fundamental Principles on Atomic Energy Policy.” In this revision, the plan stated that anyhow they wanted to build the first fast breeder reactor by 2050. Please have a look at the graph. I drew a line here to illustrate how their goal has been slipping away. Each division indicates ten years for both horizontal and vertical axes. This line means that the goal moves ahead by twenty years with the passage of every ten years. If the goal is postponed by ten years every ten years, we can never achieve it. This case is even worse. The goal is postponed by twenty years every ten years, which that tells us that we can never ever fulfill the FBR plan. But neither the Atomic Energy Commission of Japan, which spelled out these long-term plans, nor the government, which has supported the Commission, has been held responsible, to date. Japan has wasted more than one trillion yen only for the prototype FBR, the Monju. In terms of the present judicial system, one receives a year of imprisonment for a fraud of one hundred million yen. Then, how long a sentence should be meted out for a fraud of one trillion yen? Ten thousand years. I don’t know how many people are responsible for the Monju with the government - the Atomic Energy Commission, the Nuclear Safety Commission, the Ministry of Economy, Trade and Industry, then the Ministry of International Trade and Industry, and so forth. But suppose one hundred people responsible, each should be sentenced to one hundred years in prison. This fraud is enormous, but no one has taken any responsibility for it so far. That’s the reality. It seems to me that the nuclear energy business is extremely abnormal. Next, I would like to talk about the ongoing accident in Fukushima. Though I think most of you are already familiar with this matter, nuclear power generation is a technology that deals with huge amounts of radioactivity. Please look at the small square at the lower left corner here. This is the amount of uranium that burned when the Hiroshima atomic bomb exploded: 800 grams. That amount, which you can easily lift by hand, burned and annihilated the city of Hiroshima. Now, how much uranium is necessary for nuclear power generation? It requires one ton of uranium to run one nuclear power plant for one year. This gives you an idea of the enormity of the highly radioactive fission byproducts generated as a nuclear power plant operates. Here’s how they denied the possibility of catastrophic accidents. I took this illustration from the website of Chubu Electric Power. They claim that there are multiple barriers to keep radioactivity from leaking out. The most important barrier of them all is the fourth one, the reactor containment vessel. This is a huge vessel made of steel, and they adopted the idea that this vessel can always contain radioactivity, regardless of what happens. But a catastrophic accident has actually occurred, and is still going on. Tragic events are underway in Fukushima, as you all know. And the government’s responses to the ongoing accident have, in my view, been highly inappropriate. The principle of disaster prevention should be about taking preemptive measures on the basis of a reasonable overestimation of risks in order to protect people. If it turns out to really be an overestimation so that such measures are not necessary, that is okay too, because people will not have been harmed. However, what the Japanese government has actually been doing is the opposite: it has underestimated the risks and acted on optimistic assumptions. First, they said it was a Level 4 event on the International Nuclear Event Scale and stuck to that for a long time. Then they raised it to Level 5, but it was not until the last moment that they admitted that it was a Level 7 accident. Their response was way too late. The government also delayed decisions in evacuation directives. First, they evacuated those within a 3 km radius, saying it was a precautionary order for the worst case scenario. Then soon after, they evacuated those within a 10 km radius, again saying this was a “just in case” measure. Then they expanded the evacuation zone to the 20 km radius, again saying that this was preparing for the worst. In fact, they were all belated, reactive measures, instead of being precautionary. I believe disclosing accurate information is the only way to avoid panic. That way people would trust the administration and the government. However, the Japanese government acted in the opposite way. They consistently hid information, repeatedly saying that the situation was not critical. The government spent more than 10 billion yen in the last 25 years to develop the radiation dispersion simulation system called SPEEDI (the System for Prediction of Environmental Emergency Dose Information), but they hid the simulation results from the public and did not let local residents know the risks. The government has also been forcing plant workers and local residents to sacrifice without making clear who is responsible. They have raised the radiation dose limit for the workers at Fukushima Daiichi. They have also raised radiation dose limits for local residents in deciding on compulsory evacuation. Are they really allowed to do such things? I find myself at a loss when I think about the true scale of the damage caused by the Fukushima Daiichi accidents. If we apply the current Japanese law strictly, we would have to abandon an area that would be as large as the whole prefecture of Fukushima. The only way to avoid this is to raise the radiation dose limit for residents, and that would mean forcing increased radiation exposure on residents. I think that primary industry will suffer tremendously. Agriculture and fishery among others will have difficulty selling their produce and their catch. Residents will be forced out of their homeland and their lives will be shattered. Some say we should make TEPCO pay proper compensation. But no matter what they pay, or even if they pay to the extent that they go bankrupt, it will not be sufficient. Even if TEPCO goes bankrupt multiple times, it will not be enough. The damage from the accident will be so enormous that even the whole country of Japan going bankrupt might not pay for it. This of course is if they are really going to pay for the damage. In closing, I would like to quote the “seven social sins” that Mahatma Gandhi warned against, and which are inscribed on his memorial. The first is “Politics without Principle.” To those who gathered here today, I would like you to take these words deeply to heart. Gandhi’s other sins, such as “Wealth without Work,” “Pleasure without Conscience,” “Knowledge without Character,” “Commerce without Morality,” all apply to electric power companies, including TEPCO. And with “Science without Humanity,” I would challenge academia and its all-out involvement with the nation’s nuclear power policy, and that includes myself. The last one is “Worship without Sacrifice.” To those who have faith, please take these words to heart, too. Thank you very much. Koide Hiroaki is Assistant Professor at the Kyoto University Research Reactor Institute. He is the author of Genpatsu wa iranai (We don’t need nuclear power plants), Gentosha Runessansu Shinsho, July 2011), Genpatsu no uso (The Lie of Nuclear Power), Fusosha Shinsho, June 2011, and Kakusareru genshiryoku – kaku no shinjitsu (Hidden truths of nuclear power), Soshisha, January 2011). Sakai Yasuyuki is an engineer based in Aichi prefecture, working for one of the largest automotive parts suppliers. He studied Ecological Economics, Values & Policy at Rensselaer Polytechnic Institute. Norimatsu Satoko, a Japan Focus Coordinator, is Director of Peace Philosophy Centre. She leads youth and community members in learning issues such as Article 9, historical reconciliation in Asia, nuclear disarmament, and US military bases in Okinawa. Recommended citation: Koide Hiroaki, "The Truth About Nuclear Power: Japanese Nuclear Engineer Calls for Abolition," The Asia-Pacific Journal Vol 9, Issue 31 No 5, August 1, 2011. Search by keyword “Fukushima” for the wealth of articles on the Fukushima nuclear crisis on Asia-Pacific Journal: Japan Focus. 1 See “In Japan, nuclear bestsellers reflect new debate,” The Washington Post with Foreign Policy, July 19, 2011. 2 See “Information sources in languages other than Japanese on the issue of Fukushima’s children and allowable radiation dosage,” Peace Philosophy Centre, May 29, 2011.